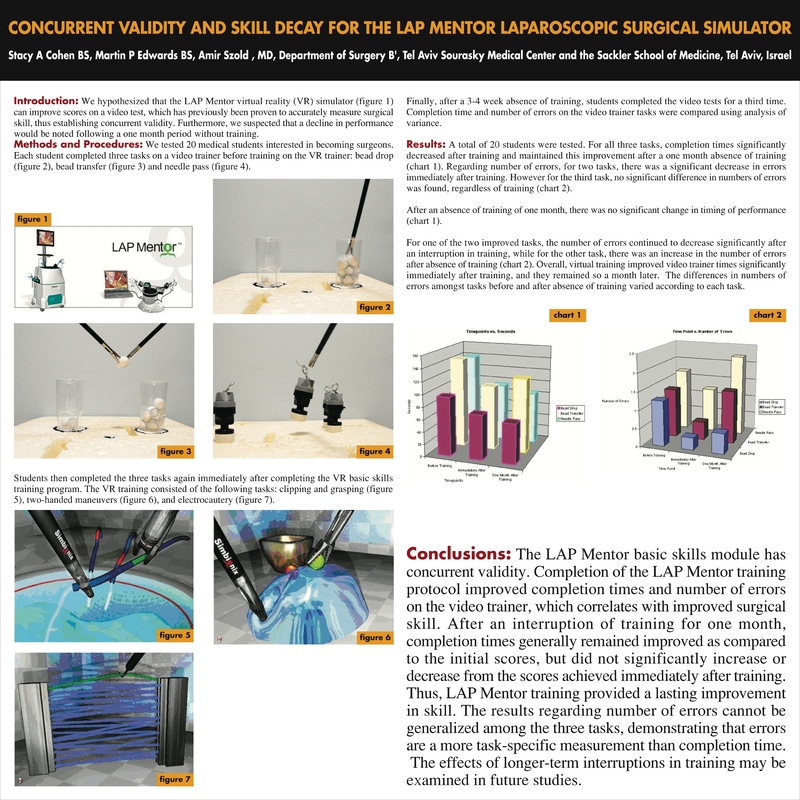 Introduction: We hypothesized that the LAP Mentor virtual reality (VR) simulator can improve scores on a video test, which has previously been proven to accurately measure surgical skill, thus establishing concurrent validity. Furthermore, we suspected that a decline in performance would be noted following a three week to one month period without training. Methods and Procedures: We tested 20 medical students interested in becoming surgeons. Each student completed three tasks on a video trainer before training on the VR trainer. Students then completed the three tasks again immediately after completing the VR basic skills training program. Finally, after a 3-4 week absence of training, students completed the tasks for a third time. Completion time and number of errors on the video trainer tasks were compared using analysis of variance. Results: A total of 20 students were tested. For all three tasks, completion times significantly decreased after training and maintained this improvement after a three week absence of training. Times neither increased nor decreased significantly after an absence of training. Regarding number of errors, for two tasks, there was a significant decrease in errors immediately after training. For one of the two improved tasks, the number of errors continued to decrease significantly after an interruption in training, while for the other task, there was an increase in the number of errors after absence of training. However for the third task, no significant difference in numbers of errors was found, regardless of training. Overall, virtual training improved video trainer times significantly immediately after training, and they remained so three weeks later. Conclusions: The LAP Mentor basic skills module has concurrent validity. Completion of the LAP Mentor training protocol improved completion times and number of errors on the video trainer, which correlates with improved surgical skill. After an interruption of training for at least three weeks, completion times generally remained improved as compared to the initial scores, but did not significantly increase or decrease from the scores achieved immediately after training. Thus, LAP Mentor training provided a lasting improvement in skill. Less notable conclusions were made regarding number of errors. The effects of long term interruptions in training remain unclear.